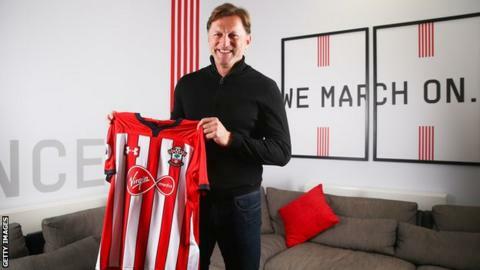 New Southampton boss Ralph Hasenhuttl says he wants to "get his name known in the Premier League" with the "challenge" that awaits him at St Mary's. "It is a logical next step in my career," said the Austrian, 51. "It is my goal to get my name known here in the Premier League. "The first target is to get out of the relegation zone. The focus for the near future has to be to move as quickly as we can up the table," he said. "It is tough but I am not frightened. "We have a lot of games coming up and if you know my football it is about training sessions and habits so when you don't have the chance to train it can be difficult to change things. "My goal is to develop the players as quickly as possible. It is about getting the defence stabilised quickly."